Corn and Powder on the same day! Welcome to March. Joe St.Onge skied with the Sirens of Snow on a beautiful early March day finding the first corn of the season and some nice settled powder to boot. Up in the Smoky Mountains just North of Ketchum, Joe St.Onge and Sara Lundy joined a group of dudes and one woman from the North skiing lots of fresh powder around the Coyote Yurt. It snowed all week covering every track! Too much fun! 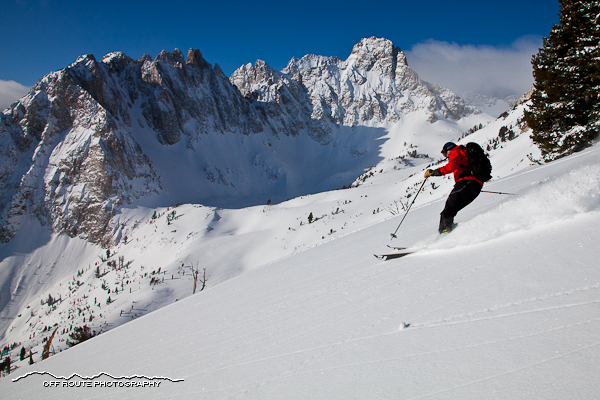 Here are some images from last weeks Daily Powder Tours as captured by guide Patrick Graham. Joe St.Onge guided a group of great skiers visiting from their home near the Wasatch this week. They stayed at the new Bench Hut in the Sawtooth Mountains. Strong lungs and legs took the team up into the alpine, skiing into the Monolith Basin one day followed by a circumnavigation of Mount Heyburn, including a descent of the Iliad Couloir, and an exploration into the Land of the Lotus Eaters. A good time was had by all, entranced by the magic of the Sawtooth and a half foot of Idaho’s white gold! Robin Carleton and 13 friends just returned from an “amazing adventure” up at our Fishhook Yurt in the Sawtooths. Check out the post and some sweet images from there trip here. We were pleasantly surprised when we learned that the Colorado Yurt Company had a replacement roof in stock for our Boulder Yurt and even more stoked to have had it arrive only one week after the wind storm incident. The roof arrived last Thursday and we were on site by 9am on Friday! Within six hours, the finishing touches were complete, the wood burning stove fired up, and a round of beers enjoyed. Once again, all is well up at the beautiful Boulder yurt!